*** Note: For best results Firefox should be used to access this site. 2.Click the Onyen Login button. 3. Enter your Onyen username and password. The My Workspace page will appear. 4. 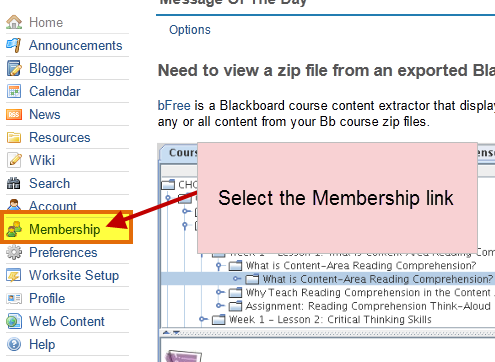 Select the Membership link located in the left side menu. 5. Select the Joinable Sites link to view the available sites. 6. Use the Search field (right side of the page) to locate the FERPA site. The FERPA training should now appear as a tab at the top of the page. Do you have additional questions about FERPA training? Contact the Registrar’s training coordinator.